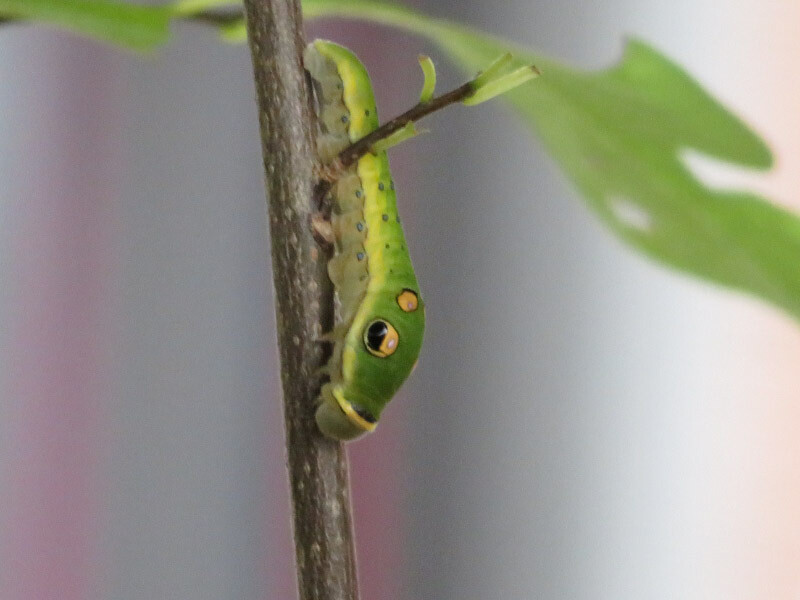 The food plant for the Spicebush Swallowtail’s caterpillar is spicebush – an understory tree here in Maryland. When the caterpillars get larger, they have spots on their head that look like eyes…and giver the illusions of a snake! They probably fool quite a few predators. The caterpillars also fold leaves around themselves when they are not active and that folded leaf may be the easiest way to spot them in the wild. Next time I hike through a forest that I know has spicebush – I’ll be taking a few minutes to look at the leaves. The caterpillars I photographed (and observed) were in the caterpillar house of Brookside Gardens’ Wings of Fancy. When the caterpillars are large enough to pupate, they expel the waste in their gut and turn from green to yellow orange. They make a big effort to leave the food plant. Since the food plant is in a pot, the caterpillars trek around the rim then fall off…trek some more…we put them in a pupation chamber so they don’t get stepped on!